With all of the craziness of Star Wars Weekend behind me, I’ve been looking to revisiting a few spots I stopped by during the event so that I could give them their due. 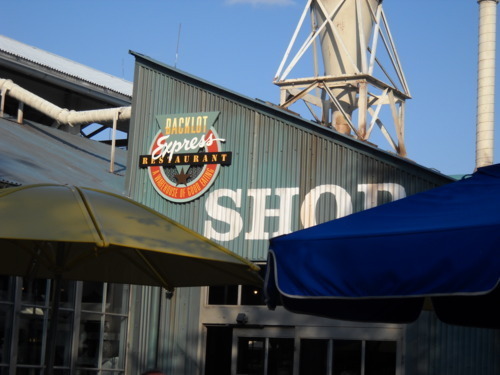 So on my first day back at Disney’s Hollywood Studios, I made a beeline for the Backlot Express Restaurant. After all, this is where one of the coolest things from the weekend happened. Yes, this is the home of the famous Cupcake of Karma. First, a little history. On Day 26 of my Blog, during Star Wars Weekend, as I waited in line to have my picture taken with Ahsoka Tano, a developmentally disabled young man crashed the line. Rather than make a scene, I chose to let him go ahead, hoping he would be finished and things would then move on – not necessarily for me, but for the others behind me who wanted to see this character before her time ran out. When I did this, the young Ahsoka said what I did was a noble gesture, and I would be rewarded. I would have accepted a simple “Thank you” at this point. But those Jedi powers are tricky. Now, as for the restaurant itself. 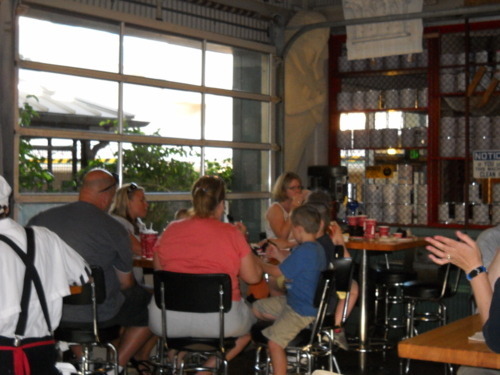 It’s a quick-service restaurant, themed around a backlot warehouse, designed for high volume. 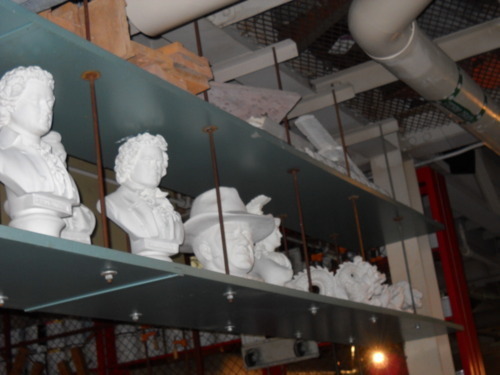 There are a number of seating areas that seem to be different rooms in the warehouse, storing paint, props, flooring, and other materials needed at a working studio. This restaurant features both inside and outside seating areas, and when weather permits, large garage doors inset in the walls can be opened to allow breezes through the spaces for cooling. The day I visited, that really wasn’t an option – it was in the mid-90’s with matching humidity. 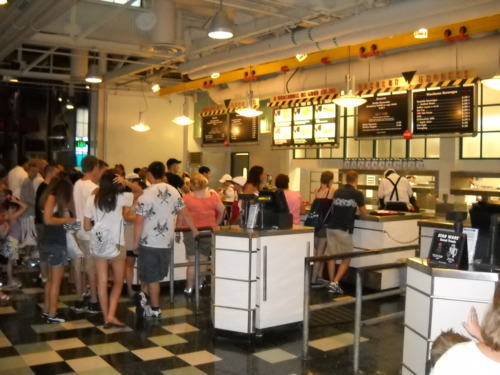 The counter service area is located at the back center of the restaurant – you pass everyone else on the way in. During crowded times, this would be an excellent point to have someone from your party peel off and find a table for you. The menu is relatively simple. There are six main entrees, served with fries, two kids entrees, a variety of sides, and a couple of desserts. (For Star Wars Weekend, they also had an extra dessert option – more on that shortly). 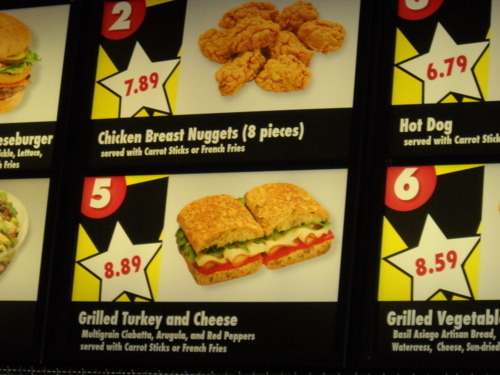 You read your choices from the menu board, and then place your order at the cash register. The (hopefully) smiling castmember will take your order, then accept your payment. This restaurant can be used for the Disney Dining Plan, the meal can be charged to your room if you are staying at the resort, or you can pay by debit & credit cards and, of course, actual cash. The process is standard fast casual Disney. Once your order is placed, you are handed a receipt and move forward to the counter where you wait. Behind the counter, servers pick up trays of food assembled in the kitchen and deliver them to you by your ticket number. This can go very quickly, although I have seen backups occur. Those usually happen when they run out of french fries – the quantity of available fries does seem to put a limit on the rate of meal delivery. Now, this is where the Cupcake of Karma joined the party. All of the trays coming out of the kitchen and delivered to other customers were brown. 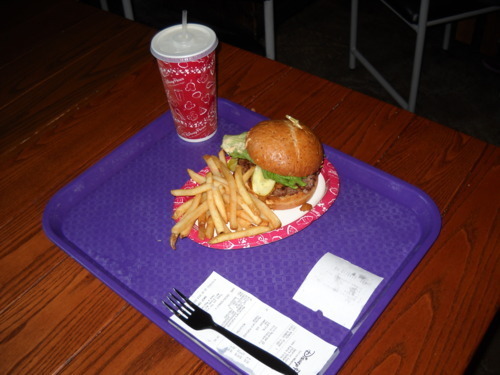 But that day, when I went to eat after meeting with the young Jedi, for some reason my food arrived on a purple tray. As she slid it toward me, the young castmember was positively giddy – and I had no idea why. Admittedly, as Jedi Mind Tricks go, it’s not the most impressive one. But you try getting a Disney castmember to give you a free cupcake with your mind. Go ahead, I’ll wait. 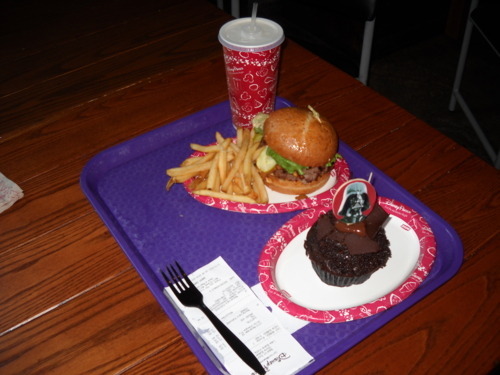 As for the food – the Star Wars Weekend meal pictured was #1 on the menu, the 1/3-pound Angus Onion Straw Cheeseburger. My opinion – meh. Indeed, I was whelmed. It was juicy but pretty flavorless. The cheese is underneath the burger on the bun and obscured by the rest of the sandwich, so it added no notes to the meal. The tomato slice was a typical hothouse tomato – juicy, mealy, and again, flavorless. This burger really is a take-it-or-leave-it proposition, with no real distinguishing features to it. The fries were the same way. The cupcake pictured was a Star Wars Weekend special – Chocolate Peanut Butter Frosting, Devil’s Food cake, very rich (way too rich for me to finish) – and considering its origins, even sweeter. My return visit had me in a different mood. I opted instead for the #5 – the Grilled Turkey and Cheese sandwich on a multi-grain ciabatta roll with arugula and roasted red peppers. Instead of fries, this time I chose carrot sticks for a side. As flavorless as the burger had been, this sandwich was not. The red pepper flavor fairly leaped from the first bite and stayed with you until the last one. The coarseness of the roll, the snap of the lettuce, the tang of the cheese, the saltiness of the turkey all played together into a delightful meal. The carrot sticks were the usual pre-bagged ones, but they were fresh and crisp. There are two large beverage and condiment stations at the restaurant, and with the purchase of a beverage, you have your choice of about a dozen different Coca-Cola products, as well as four different iced teas. Coffee is also available if you’d like. My sister has asked I look for healthy alternatives with all my restaurant reviews. There is a vegetable-only version of the ciabatta sandwich, and a tossed chicken salad, both of which might qualify. However, I did find one glaring flaw. When I asked a castmember for the nutrition information, I expected to either be handed a brochure or be sent to a website. Instead, the castmember reaches down and pulls out a white binder – all she could show me were a set of documents with nutrition info for each of the various ingredients of each sandwich, from the industrial packaging. In a day and age where communities are forcing restaurants to post calorie counts on the menus, the fact Disney hasn’t created a nutritional information brochure or website is a glaring omission – and one that needs to be remedied as soon as possible. It’s not haute cuisine at Backlot Express. It’s designed for families, folks in a hurry, someone making a pit stop between the Indiana Jones Stunt Show and Star Tours. But it is pretty good at being what it is designed to be – and that’s a good thing as well. 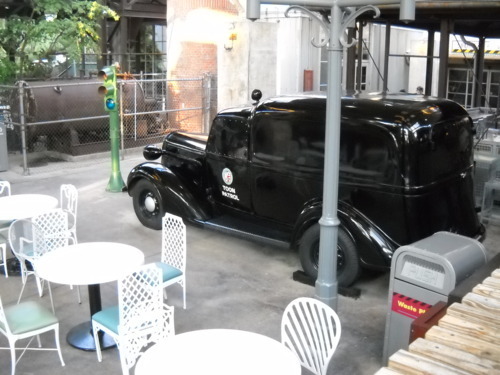 One last thing – in the exterior courtyard of the restaurant is a 1940’s panel van. Sharp-eyed observers will notice the words Toon Patrol on the door, and immediately recognize this as the van used by Judge Doom’s Weasels in Who Framed Roger Rabbit? At one time there had been considered an attraction area for Disney’s Hollywood Studios based around that film. It just goes to show, with Walt Disney World, nothing really goes to waste. Not even a good Cupcake of Karma.